We at JAM Systems know your free time is a valuable facet of your life. Life is short. Certainly too short to spend it sanding, painting, staining, and waterproofing fences and railings you’re supposed to be enjoying! JAM Systems offers maintenance-free vinyl products that look great year after year, without the hidden costs of upkeep associated with alternative products. Savvy homeowners realize the initial investment and upgrade to quality vinyl actually saves time and money because there are no “hidden” costs as found in other materials. If you are reading this, you are obviously interested in quality and lasting value. JAM Systems vinyl products are the answer. In your research, you’ll find a variety of sources for vinyl of varying quality, from discount home improvement stores to online “wholesalers.” With over a decade of experience, we at JAM Systems are committed to the top-quality materials and outstanding service. We empower our customers with options and styles not found elsewhere. Our motto is “What you can imagine, we can create,” and we back our products with a lifetime warranty. Should you have any questions, we are available to help, and builders repeatedly use our products for reliability and ease of installation. JAM Systems is recognized as a trusted, friendly, and reliable source for vinyl products throughout the United States. 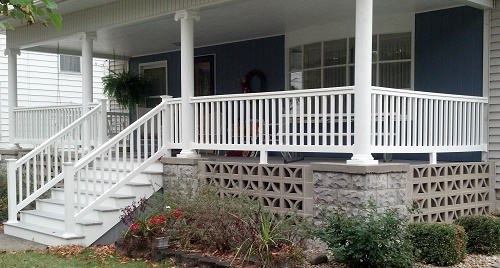 You’re not just getting our beautiful quality fencing, railing, and decking- you’re getting peace of mind. It’s our personal guarantee to you. JAM Systems will help you create a project you can be proud of… and enjoy for a lifetime. Copyright © 2019 JAM Systems.